When I wrote about last year's Oregon Beer Awards, I predicted organizers would iron out the hiccups that undermined the quality of the first-time event. Sometimes I'm right, sometimes I'm wrong. But I was right about this. This year's OBA was much-improved. Full disclosure. I was a member of the large group of folks who judged beers back in January. I was also a member of a smaller group of "experts" who compiled the Top 10 list. 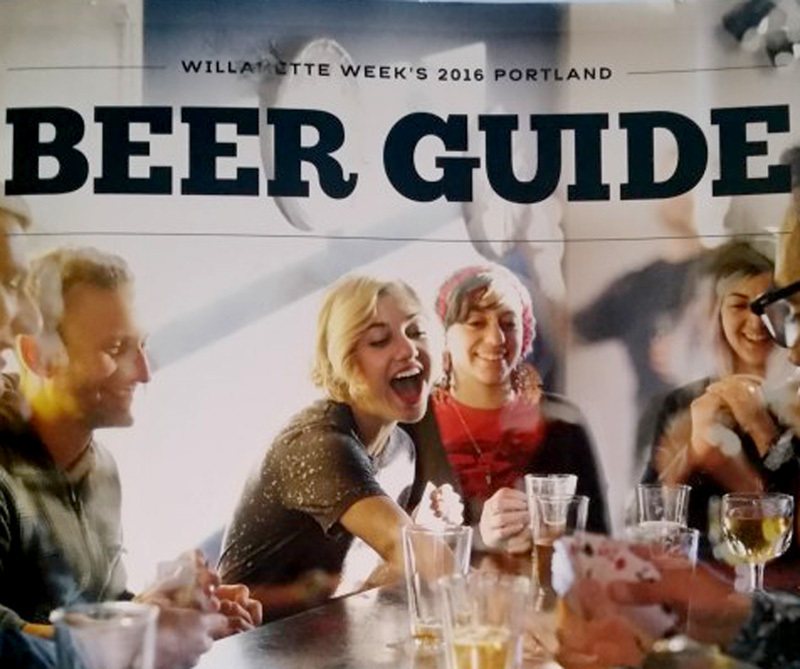 And I wrote several snippets for the Portland Beer Guide, which you can get around town or access online here. What did they do better this year? First, they got serious about objectively judging the beers. The tasting panel was expanded from roughly 20 to over 100. Tastings were double blind, meaning we had no idea whose beer we were tasting. Beers that won medals were chosen objectively. No politics, labels or other distracting details involved. Second, the awards event itself was vastly improved over last year's half-baked affair at the Doug Fir Lounge. As a venue, Revolution Hall worked pretty well. It's bigger and the layout is better. Organizers had an auditorium with a stage, an MC, a flock of presenters and projected images that reflected what was happening. The results have been posted in various places, so I'm not going to post them here. Did I agree with every medal choice? Hell no. But it doesn't matter because I know how the tasting and judging was done and I'm confident every beer that won deserved to win. Jeff's informed thoughts are here. There were surprises for sure. The biggest upset of the evening, in my estimation, occurred in the Sour and Wild Beer category. It was there that Stickmen snatched the Gold medal, with Cascade taking Silver and Bronze. It's well known that Stickmen has had some issues. Some wondered if perhaps one of their standard beers had gotten mixed up with the sours. Not very nice, eh? A tribute to the late Fred Eckhardt, presented by Lisa Morrison, was nicely done. Fred was posthumously receiving a Lifetime Achievement award and being inducted into the "new" Hall of Fame. I wondered who's Hall of Fame. Willamette Week's? I'm pretty sure there's more than one Hall of Fame inducting members. That needs to be fixed. One Hall of Fame, please. The highlight of the evening for me occurred when former Portland mayor Bud Clark appeared on stage to present the IPA medals, our version of Best Picture at the Academy Awards. Clark, founder of Goose Hollow Inn in 1967, was mayor from 1985 to 1992, formative years for craft beer here. He was later pictured on Bridgeport's Old Knucklehead label. It was pretty cool seeing the 84-year-old up there presenting and I made a point to tell him so. Where does the event go from here? It's pretty clear the Oregon Beer Awards will evolve into our own little GABF. Revolution Hall was packed to the gills and there's no reason to think attendance is going to do anything but grow. They will almost certainly have to look for a larger venue next year. Besides a larger venue, they're going to have to rethink food. Event tickets supposedly included sandwiches from Bunk. The reality was something different. Runners would bring out trays of sandwiches that instantly disappeared in feeding frenzies. Yet beer, which you paid for after the freebie built into your ticket, was plentiful. This needs to be fixed. I also wonder why we can't add a bit of class. Call me old fashioned. I don't expect brewers and industry-connected folks to show up in tuxedos. But why do so many presenters and medalists show up onstage looking like characters out of a Dickens novel? Put a little style into it, folks. Honestly, the shortcomings are best viewed as scars in fine leather. The progress they made from last year to this year was huge. A lot of the credit belongs to Steph Barnhart, organizer extraordinaire for Willamette Week (whatever you're paying her, it isn't enough) and to Breakside's Ben Edmunds, who worked tirelessly to organize the beer judging. There's also Ezra Johnson-Greenough, who played a major role in creating the OBA concept and shepherding the judging and awards. Thanks for the recap, Pete, since I didn't make it. May have to make it a greater priority next year. Even without being there I agree that both Steph and Ben deserve much of the credit for this event. Thanks, Pete, for participating, writing and sharing. Re: Hall of Fame - From our research, we understand that the Portland Craft Beer Festival has a PORTLAND craft beer hall of fame. Our's is hopefully the start of something that encompasses beer community members statewide, as the awards themselves reflect. Steph, thanks for stopping by. My opinion on the Hall of Fame is pretty simple: It cannot and should not reside in the hands of any for-profit organization. Oregon State University is the logical place due to the fermentation program there and the fact they they're building an archive of materials. However, I believe the Hall of Fame needs to be in Portland, home of Henry Weinhard, the Bottler brothers, Henry Saxer, Arnold Blitz, Charles Coury, the Ponzis and a host of iconic craft brewers. We need to figure out a way to make that happen. It's fine for WW to have its Hall of Fame and for the Portland Festival to have its version. But we need a single, official Hall of Fame where members are chosen based on objective criteria, subject to voting by people who actually know the history and the landscape. The initial list of inductees ought to include all of the iconic names from the early craft period and the earlier history. I have no idea why anyone would want to induct a single person, when so many belong on that initial list. I believe the Hall of Fame was mostly my idea but is envisioned more as an Academy Awards style Lifetime Achievement award. I think in future years you will see it going more that way. Unless I get over-ruled. I personally favored just making it Fred this year. I feel like he was such an important and singular force in Oregon beer that with his passing it would be tacky to induct anyone else beside him. I generally like Ezra's idea—his vision is so key to this whole event—and I think there is much to discuss about how to handle that award. The food was always great, I think they just updated their menu and it's off the hook. Who would expect delicious pizza at such big events. Not me, but you can get some of the best pizza there. The best event venues this area.